The brain's electrical charge is maintained by billions of neurons. Neurons are electrically charged (or "polarized") by membrane transport proteins that pump ions across their membranes. Neurons are constantly exchanging ions with the extracellular milieu, for example to maintain resting potential and to propagate action potentials. Ions of similar charge repel each other, and when many ions are pushed out of many neurons at the same time, they can push their neighbours, who push their neighbours, and so on, in a wave. This process is known as volume conduction. When the wave of ions reaches the electrodes on the scalp, they can push or pull electrons on the metal on the electrodes. Since metal conducts the push and pull of electrons easily, the difference in push or pull voltages between any two electrodes can be measured by a voltmeter. Recording these voltages over time gives us the EEG. The electric potential generated by an individual neuron is far too small to be picked up by EEG or MEG. EEG activity therefore always reflects the summation of the synchronous activity of thousands or millions of neurons that have similar spatial orientation. If the cells do not have similar spatial orientation, their ions do not line up and create waves to be detected. Pyramidal neurons of the cortex are thought to produce the most EEG signal because they are well-aligned and fire together. Because voltage fields fall off with the square of distance, activity from deep sources is more difficult to detect than currents near the skull. [Wikipedia] A typical adult human EEG signal is about 10 µV to 100 µV in amplitude when measured from the scalp  and is about 10–20 mV when measured from subdural electrodes. [Personal note] How fast they go, that is how fast they increase and decrease, or how many bell curves or cycles they do in one minute is their frequency. We measure it in cycles (or bell curves) per minute. Here are 3 to 4 cycles per minute. This pattern is called “Delta waves”. It is related e.g. to adult slow-wave sleep. Here are 7 cycles per minute. This pattern is called “Theta waves”. It is related e.g. to idling or drowsiness. Here are 7,5 to 12,5 cycles per minute. This pattern is called "Alpha waves". These predominantly originate from the occipital lobe during wakeful relaxation with closed eyes. When we close our eyes occipital alpha waves are the strongest EEG brain signals. "(Wikipedia: An alpha-like variant called mu (μ) can be found over the motor cortex (central scalp) that is reduced with movement, or the intention to move." Here is a representative pattern of “Gamma waves”, the highest frequency. They range from 30 to100 cycles per minutes. This is the behavior of our brain when we focus on a cognitive task or motor task. For instance when we are concentrating at work or when we do sports. Lambda waves which are approximately 200 Hz are associated with extremely fast eye movements (saccades) such as when exploring a room (link, link2, link3). Hyper gamma which are about 100 Hz and also lambda, are associated among other with extraordinary abilities of certain Tibetan monks such as resistance to subzero temperatures (link). 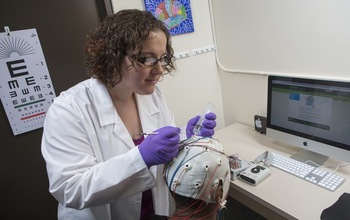 Cybersecurity researcher from Texas Tech U takes two EEG-based authentication systems (Berkley and Binghamton-Buffalo adaptation) and trains them on old medical dataset of EEG scans from a group of alcoholics. The machine learning classifier succeeds in picking up 25% of alcoholics in the sample. "'Brainprint' Can Identify You With 100% Accuracy"
Sleep Spindles or Sigma Waves: 10–16 Hz oscillations lasting 0.5–2 s. Thalamic pacemaker necessary & sufficient for their generation. "By analyzing brain activity response to visual and thought stimuli, we can identify the individual with 100 percent accuracy." "She takes repeated recordings of brain activity while a child reads. Her lab is now beginning to understand characteristics that, when taken together, represent red flags discernable early enough in brain development (say in a four year old who has just barely started to understand letters) to allow for a predictive test and early intervention. "If we can identify kids that will be dyslexic and help them before they even have a problem, it is really a big deal," Laszlo said." On 2015-03-02, an important study was published by Harvard Medical School researchers at the VA Boston Healthcare System (VABHS) concerning these waves. "This is a move toward a unified theory of consciousness control," said co-senior author Robert McCarley, HMS professor of psychiatry and head of the Department of Psychiatry at Boston VA Medical Center. "We've known that the basal forebrain is important in turning consciousness on and off in sleep and wake, but now we've found that these specific cells also play a key role in triggering the synchronized rhythms that characterize conscious thought, perception and problem solving." "What we found is that the PV neurons in the basal forebrain fine tune cognition by putting into motion the oscillations required for higher thinking." Using a technique called optogenetics, where cells are genetically altered with photosensitive switches, the researchers toggled the PV neurons on and off using laser light. If the basal forebrain plays a role in switching the cortex between waking and sleeping states, perhaps the PV neurons play a role in more fine-grained aspects of consciousness.